After a friend recently asked for my help finding some solutions with her troubles, I was reminded of my days in Germany in the mid 90s where I was having similar issues. It was there that I learned about how ‘positive language’ (a subject that’s challenging to talk about these days without sounding like some sandal-wearing new-ager) can have profound affects on one’s life. Whether you believe you’re talking to a higher power – making them aware of what you want to manifest in your life – or simply retraining your brain, I told her about how I started turning what I knew I didn’t want: “…a job too far from home; a job without enough pay…“ etc. into something I did. I learnt to apply two simple rules; use positive words (no don’ts or Shouldn’ts) and express wishes in the present tense – as if one already has them. The results were something like “I now am enjoying a job close to home where I earn enough money and more…” etc. I made my ‘life-list’ and stuck it up around the house and car where I could see it. I remember chuckling to myself when reading it aloud at first, my brain scowling chastisements like; You? You’re not gonna get that! You don’t deserve those! Repeating it to myself sounded so contrived at first, but I persevered. In a job interview, I was offered double my current pay for the same job! Was that to do with how I’d presented myself, or the changes I’d made to my attitude? I have no idea. But what was interesting is that I actually felt I deserved it… that I was worthy of it! THAT was the transformation. In me. And it felt good. And, to prove affirmations work, I have two… yes TWO new artists to introduce you to this month. And the story on the first is a blinder. I was recently so taken by an artist’s work on Facebook, I wrote to tell him so. Blow me down if he writes back 10 minutes later and says that the week before, he was pressing his nose up against THG’s window on my day off! 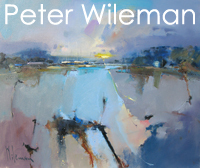 That man is Peter Wileman and he is so keen to work with us, he’s painted some new work of the Roseland just for you! Peter certainly has an astonishing pedigree. 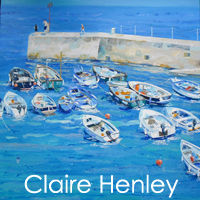 A multi-award-winning painter, he was also President of the Royal Institute of Oil Painters, is an Associate member of The Royal Society of Marine Artists and (like me) a Fellow of The Royal Society of Arts. Peter has worked in the field of art and design for over 40 years and we’re flattered and excited he’s now going to be part of THG’s motley crew! Gorge! And I’d like you to welcome the lovey Jenny Aitken to the fold as well. Jenny has been with us for a few months at our sister galleries in the Bedruthan and Scarlet hotels. She’d been selling so well, I begged her to find the time to supply THG central, too. I wasn’t quite prepared for the stunning works she’d give us, though. Quite astounding. Check them out for yourself here. So what else is new? 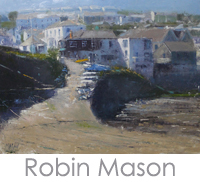 Well Robin Mason came in with some new work a week or so ago. Is it my imagination, or is that boy just getting better and better? Decide for yourself here but suffice to say three sold on the day they came in, so hurry! 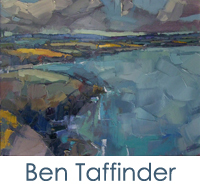 Ben Taffinder has been working on some newbies for us, but as with all of his heavy pallet knife work they take almost a month to dry and frame, so we’ve had to be patient for their appearance. But there here now, so enjoy! And blimey they’re pretty! We’ve had Neil Bolton here painting for us this last week. Always nice to see that fella. He bought in three new pieces, but one sold within 4 days so we’re waiting for the newbies (one of Greeb point is already online – and here)! Lovin’ this! 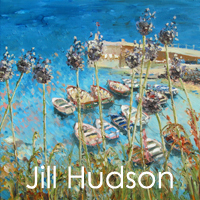 Jill Hudson is painting like a madwoman for us as she sold so many while she was away. So she’s got not only a back-log to fill the holes on her part of THG’s walls, but with commissions to do to boot, I’m having to become a hard taskmaster these days! She’s come up with the good, though and they’re live now on her page. 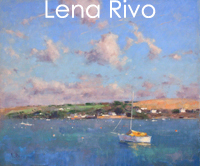 And we’re just about to have a whole new batch of work from our wunderkind, Lena Rivo soon, too. 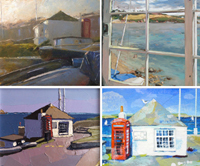 She’s created a new style just for THG, which include all the plein air preparation she did on her trip to the Roseland just for you! Gotta be worth a butchers, or? So there it is. And in closing, I want to thank all those who wrote about the Fisherman’s Shelter (and also to those who thought of doing so, but didn’t have the time… it’s the thought that counts!) I’m delighted to say we’ve had a favourable result, although not entirely without prisoners. We’ve had to lose two 3-day events, but I have solutions for those, so you’ll still get to meet all the artists we had planned, one way or another. So thanks Soooo much. Your support was a great help! The final dates are now live here. For now, though, Adios, amigos! 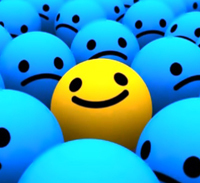 It wasn’t until my mid thirties that I learn one of life’s valuable lessons: to accept change. We all have an idea of where we’d like to go in life but rigidly holding to that pattern can so often be detrimental to both ourselves and to those around us. 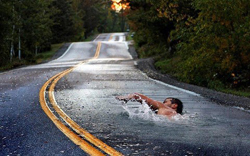 Having a goal is essential, of course, but I likened my revelation to having been swimming in a stream against the tide. It took a huge amount of energy to fight the ‘flow’ but I still went in the opposite direction. Added to that, I was being splashed with negative forces, and the branches of opportunity only became visible after I’d missed them… read more.